Horse riding offers mastery and a sense of adventure to horse campers of all skill levels. Campers enjoy a variety of experiences with our professional instructors and well-trained horses. Left: Out on the Hidden Valley range. Right: Our horses receive a lot of love. 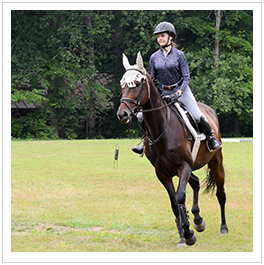 Classes are geared to all levels and include practice in our rings as well as rides on HVC’s open fields and extensive forested trails. We provide helmets and other gear; campers need only bring boots with a heel. Top Left: Vaulting is like doing gymnastics on a horse. Top Right: Trail riding on our miles and miles of trails. Bottom Left: Learn all about horses from our local vet. Middle: Two campers give a horse a makeover. Middle Right: Out on the Trail. Bottom Right: Jumping! Left: A riding class takes a lap around the ring. Right: A Brumby camper and her horse. When Max got off the plane, he said he was "privileged" to have such great riding instructors! He's really into riding now. I will never forget the joy of my time in the "riding cabin", spending endless hours with the beloved horses, or the bonfires under the big sky, crying my eyes out singing "Leavin' on a Jet Plane." We chose HVC of the warm nurturing environment, the ability to have a horse to care for but to also have the benefits of an all around camp to explore other interests. The Specialty Riding Group, Brumby, is for experienced riders. These campers live with the riding staff in a special cabin by the stables where they manage their "own" horse. This responsibility involves feeding, grooming and tacking-up each day. Brumby campers ride for at least two hours daily. Special programs include dressage, jumping and other events in camp horse shows, and late afternoon trail rides. Find out more here or call our office for more information. The Brumby culture of hard work, responsibility and camaraderie is terrific and very special.